By Jiro Tanibuchi. English edition 2009. by Fanfare [ press ] Wisbech, England. 2 vols. Graphic Novel. Interesting take on time travel — a man finds himself back in junior school living again in the family of his youth – before his father leaves them. Experiencing young adolescence with an adult eye. Friendships, romance, loss of a parent. The drawings are restrained and intelligent and highly crafted. A very enjoyable read. 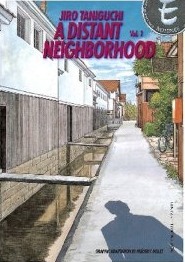 This entry was posted in Uncategorized and tagged Book reviews, Graphic Novels, Japan. Bookmark the permalink.